What is a Quick Hitter? The Quick Hitter allows a coach to find information on a very narrow topic. The coaches sharing this topic still provide great detail. The Quick Hitters will be valuable tools for a coach looking for specific ideas. This type of information is useful both the off season as well as during the season. As we build our library, we will incorporate a cutting edge search tool allowing a coach to get the exact resource he needs to solve a problem or improve a certain aspect of his own system. The Quick Hitter gives you the critical information you need right now. Zach Tinker shares how they utilize the Diamond Pistol formation and a set package of plays to improve their scoring opportunities in the red zone. His approach allowed South Dakota School of Mines to score 42 out of 43 (.977) possessions in the red zone. The “Power” scheme is one of the most widely used schemes in all of football. It is a scheme you will see used at every level of football. What I love about the power scheme, and why I chose to add it as a core concept of our running game, is the wide variety of ways I can use the scheme. 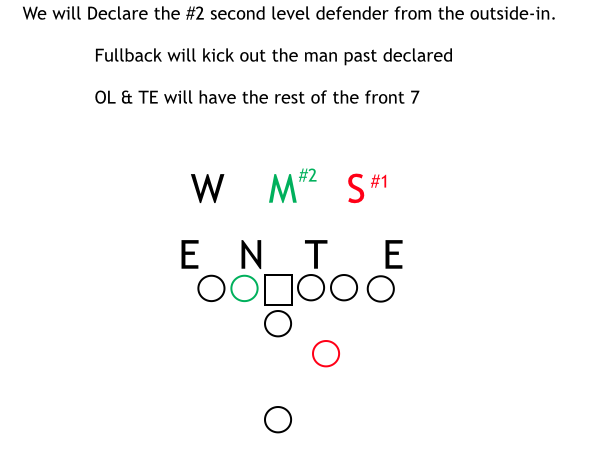 This one core blocking scheme for the OL, can be used in an exponential number of ways, all dependent on the imagination of the offensive coordinator. 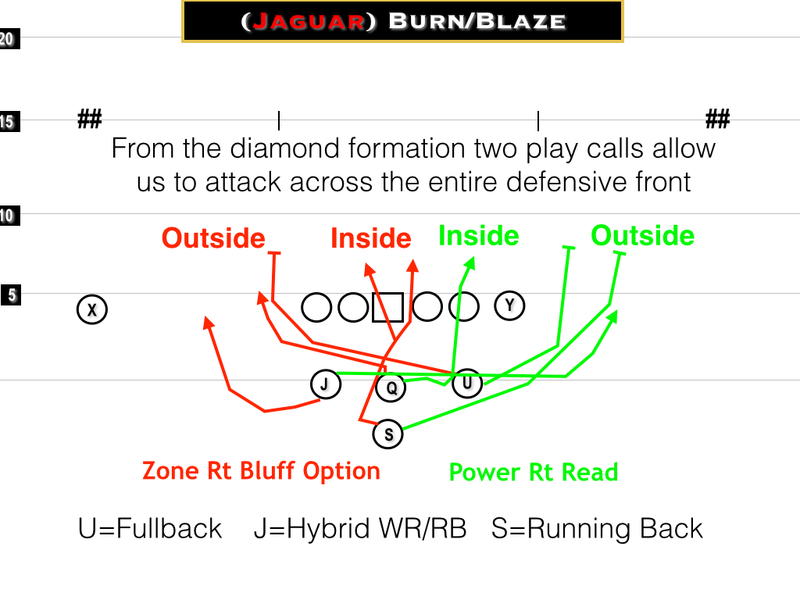 Power can be run from nearly any personnel grouping, formation, or backfield action. This Quick Hitter goes through the assignments and techniques of each offensive lineman. Video shows exactly the footwork and technique that the linemen use. This progression goes from learning on air to executing against shields. This attitude play can be learned and repped without pads. Coach Girolmo has a unique application of the Power scheme which goes beyond the basics that he explains in setting up the play. Girolmo explains what the “ formation formula” is as well as what he looks for in setting up the formations in his game plan. He follows with the assignments, techniues, and mechanics for all players. Girolmo explains how to use the “coverage trangle” and the T.U.G screen to make the defense pay for exposing its weakness. Girolmo uses a number of variations including one back and two back Power. By adding a mesh read and a pitch man, Girolmo turn the Power scheme into a triple option attack. This Coaches Edge Quick Hitter presents plenty of information and definitely adds some voltage to the Power scheme. I am VERY excited as the work for the webinar shapes up. I’ve been putting the finishing touches on the presentation, and think it will be an excellent primer to both the upcoming iBooks and subsequent webinars. We are scheduled to go for 90 minutes, but the content might honestly run over. If we do, we hope you can stay plugged in. We are set for Tuesday, February 10, from 8:30 – 10 pm Eastern. The registration link can be found here. As far as content is concerned, I will not simply regurgitate old information (though I might reference some previous work); these sessions are intended to advance and expound upon the iBooks, although the teaching is conceptual and it is not necessary to know my terminology etc in order to get the full benefit of the lecture. This is a very broad, 50 thousand-foot overview; each bullet will have several subtopics. For example, will also dive into the GAP SCHEME run game that I have used, as well all attachments and tags. I will cover formationing, and touch game planning and teaching considerations as well. As stated earlier these topics will flow nicely into not only the iBooks, but into upcoming webinars as well. For example, Webinar 2 will feature the Cover 3 section of my game planning tool that I call HIT LISTS – designed to give coaches brainstorming capabilities, while still allowing to stay in the confines of their offense. Get Dan Gonzalez’s The Need for Change and The Blue Print. 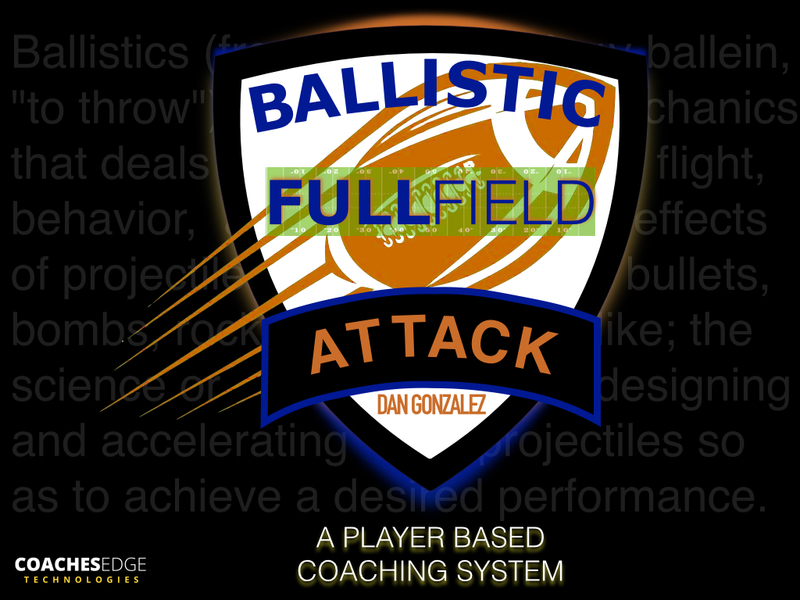 Dan Gonzalez webinar series will be packed with information that any offensive coach can use. Check it out here. Email me grabkj@gmail.com. Put “Gonzalez” in the subject line. Upon your registration you will receive a code for A Coaching Arsenal iBook and be entered in a drawing to win 5 Coaches Edge current or future titles of your choice. This happened in the Cowboys game versus the Giants. Romo stepped to the line to identify the Mike Linebacker. Not all teams use this system. 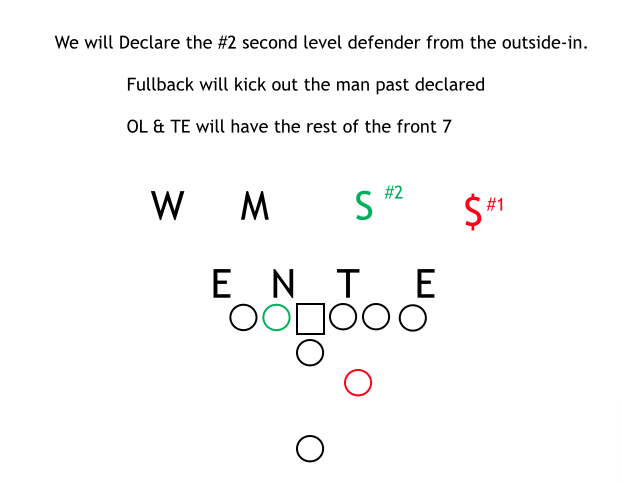 It’s something that I did not start using until I coached at the college level, but it is a simple tool to help the offensive line block different fronts on both run plays and pass plays. Procedurally, we had both the center and the quarterback identify the Mike linebacker. The center would not say anything unless he disagreed, at which point we instructed the quarterback to use the center’s call. The helped some of our younger quarterbacks. We moved to the quarterback using this system because it allowed him the flexibility to marry protection with his hot routes which became important at times. In the run game identifying the Mike allows the line to determine their assignments, especially when determining who is being combo blocked or double teamed, and which linebacker that double team is working to. 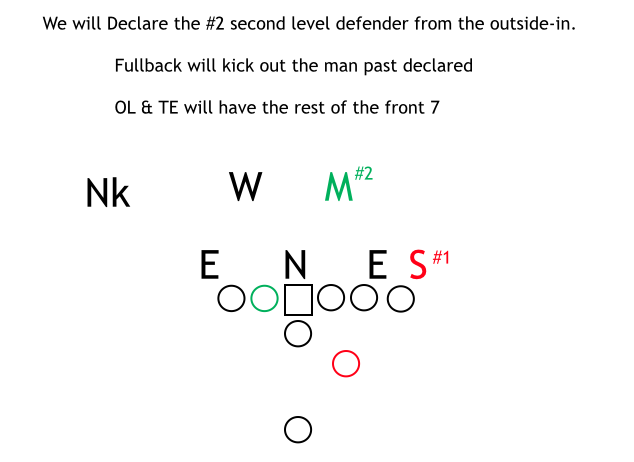 Here is a slide from our playbook in which we are running a two back power concept. In this play, our rule is to declare the #2 second level defender as the Mike. The rule is that the combo on the 3 technique is working toward the linebacker past the Mike to the backside. The Fullback will kick out #1 and the pulling guard will be pulling for the Mike. 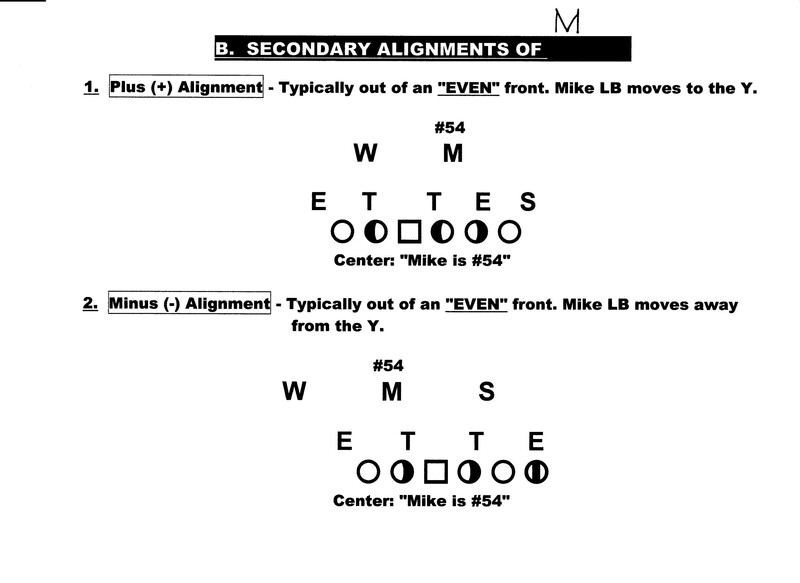 Note that the defender the offense identifies as the Mike may not be the true Mike in the defense’s scheme, though they will typically not try to argue with the quarterback as McClain did with Romo. In the passing game, we used a man side and a slide or zone side. This was called by giving an Roger (right) or Louie (left) call and identifying the Mike linebacker as being in the slide side sort. 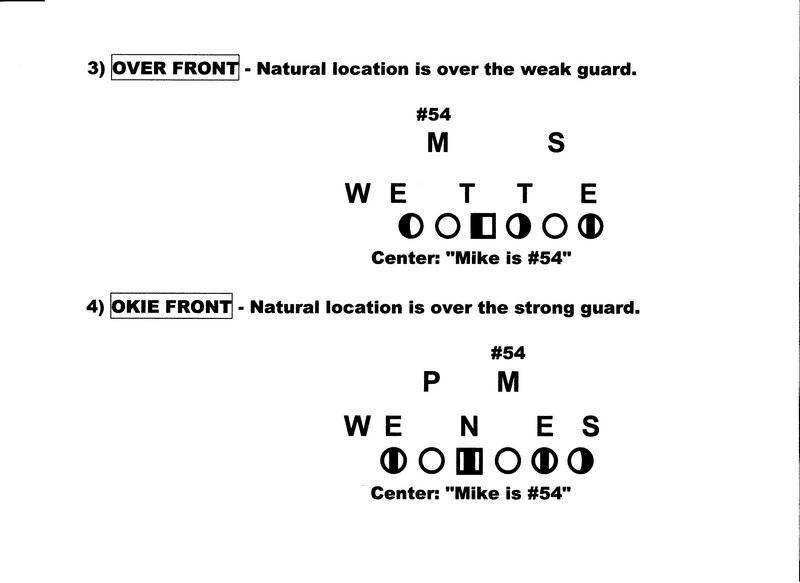 Last season, my 10 year old son asked me, “Why does the quarterback say ’52 is the Mike’.” I explained and taught him, and then pulled up some plays on Hudl and had him declare the Mike. He picked it up pretty quickly, so I know this is a concept that can be used at the high school level. More than anything, this keeps the quarterback and the offensive line on the same page and helps give any play success because every defender is accounted for. 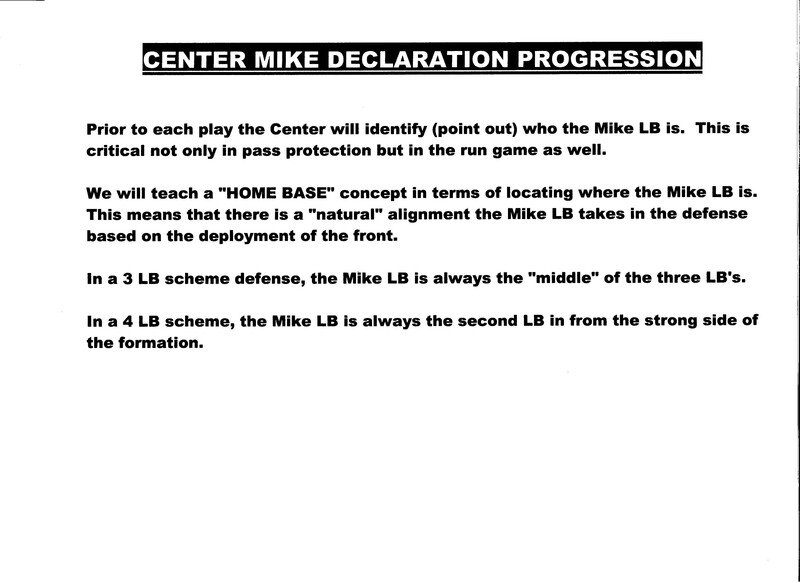 Coach Bill Mounty shared this information on designating the Mike. It lays out the procedure. Please check out my interactive books. These present an innovative way to learn the game. 101+ Pro Style Pistol Offense Plays and The Zone Running Game: Create a Structured System. Both resources are filled with detailed information, interactive presentations, and game film. My next article in a series of developing an offensive system is up on USA Football. The series of articles presents ideas on building an offensive system that are further detailed in my newest book The Zone Offense: Create a Structured System. Once you establish a base play as a starting point for your offense, it becomes clear as to what answers a defense needs to stop the base play. 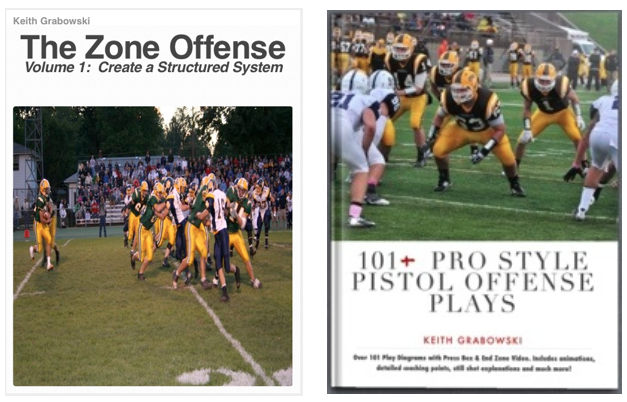 My first book 101+ Pro Style Pistol Offense Plays is available as the entire series or in chapters by play. The read game allows the offense to attack the defense where they become weakest based on post snap keys. The power read allows for a gap scheme read concept that attacks inside and outside in one direction at the same time. The zone option allows for an A-Gap to A-Gap inside run that can hit front side or cutback as well as attacking the perimeter opposite the inside zone. The personnel we use gives us a fullback, running back and a hybrid receiver/running back in the backfield along with a dynamic quarterback. As seen in the diagram below, just two play calls allow us to attack the entire front. Read about developing an offensive system in my new iBook The Zone Offense: Create a Structured System. Learn more about our pistol offense in 101+ Pro Style Pistol Offense Plays. Both are full of dynamic content – diagrams, animations, presentations and game video and are available for the iPad or Mac on the iBookstore. I love studying old football books. Though we think that this idea or that idea is cutting edge in football, you see that the coaches from the past had similar ideas. The game just evolves so that what we see on the field looks revolutionary, but really that idea existed somewhere in the past. For example, I found a video on the internet of the ball being snapped in three seconds. This was before the days of helmets, but even, some kind of communication system had to exist to let the players know what to do on that particular play. …We made every pass look like a run and every run look like a pass. Offenses that pass from a pocket split their attack into two phases-their running game and their passing game. The setting up of the quarterback in the pocket screams “Pass” to every defender on the field. Even though pocket-passing teams often fake the ball to a runner before setting up in the pocket, still the fake wards off detection for only a moment, after which all defenders spring into anti-aircraft action. The Run and Shoot offense did not split its attack–it was just one game, running and passing performed anywhere anytime with no distinguishing clue to signal run or pass. Whether we are talking packaged plays in which the offense is either running or passing based on a pre or post snap key, or whether we are talking “constraint” plays which look like and work off of a base play Tiger Ellison’s philosophy of attacking a defense holds true today. The concepts and schemes we use may be different, but the philosophy is the same. 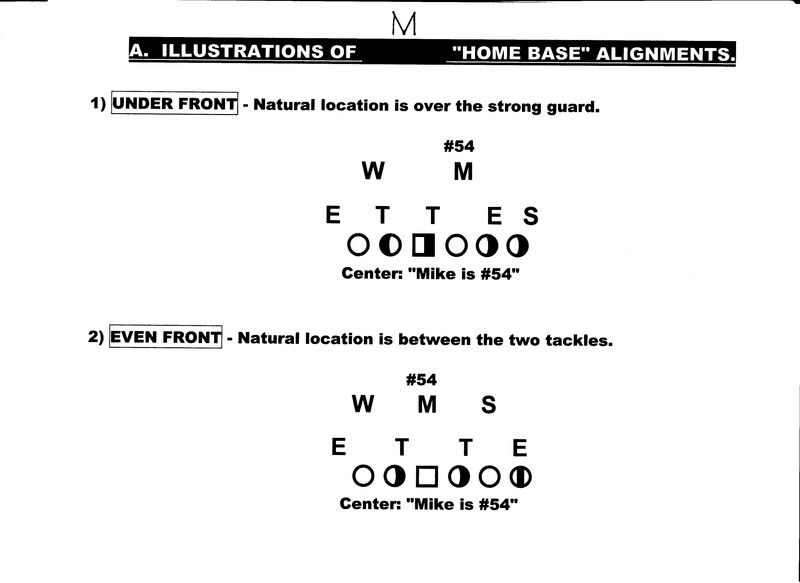 For more on base plays read my post on USA Football. For more on packaged plays check out my resources link. My iBook 101+ Pro Style Pistol Offense Plays uses a similar philosophy as that described as Ellison in creating a run game and pass game that look the same.